Leadership, quantitative, problem-solving and communication are all excellent and necessary skills to have if you want to land a top finance job in the United States, but if you want to find work in China, you're going to need a few more, such as the ability to binge drink. 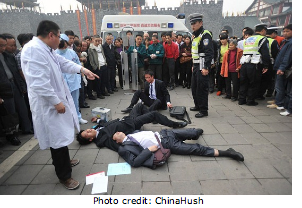 Yesterday, four Chinese men (two of who were students) passed out in the middle of a busy shopping district in the province of Chongqing, underscoring the increasing need by young Chinese jobseekers to have that something extra that sets them apart from their peers. According to the South China Morning Post, "Mainland job-seekers are increasingly required to exhibit 'grey skills' -- binge drinking, playing mahjong and even ballroom dancing -- to provide them with an edge in the job market." A sociologist and professor from Peking University interviewed by the Morning Post said "job-seekers had no choice but to conform to the mainland business culture, where wining and dining are part of the protocol." But he warned other jobseekers against "emulating the drunken trio and believing 'social skills are more important than professional skills.'" The incident, which resulted in three of the men being led away by ambulance, has already resulted in the creation of at least one new mainland organization: M.A.D.I. (Mothers Against Drunk Interviewing), whose mission is to fight against the need to exhibit "grey skills."